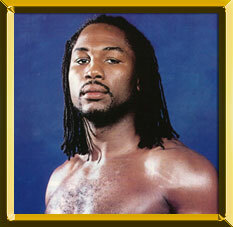 Born Lennox Claudius Lewis in West Ham, England on September 2, 1965. The 6' 5” Lewis registered an 85-9 amateur record and capped his amateur career by defeating Riddick Bowe for the 1988 Olympic super heavyweight gold medal. After turning pro in 1989, he won the EBU heavyweight title in 1990 and scored wins over Gary Mason, Mike Weaver, Tyrell Biggs, and Levi Billups before TKO'ing Donovan (Razor) Ruddock in two rounds in 1992 for the vacant WBC title. Lewis successfully defended three times (Tony Tucker, Frank Bruno and Phil Jackson) before being upset by Oliver McCall (TKO by 2). Wins over Tommy Morrison (TKO 6) and Ray Mercer (W 10) set up a successful WBC title rematch with McCall (TKO 5). Four successful defenses followed, including wins over Andrew Golota (KO 1) and Shannon Briggs (TKO 5). On March 13, 1999 he met WBA / IBF champ Evander Holyfield in a highly anticipated unification bout. The bout, the highest grossing fight at Madison Square Garden, was ruled a controversial draw. However, Lewis scored a 12-round win in the rematch eight months later. Defenses over Michael Grant (KO 2), Frans Botha (TKO 2) and David Tua (W 12) preceded a 5th round KO loss to Hasim Rahman in 2001. Lewis avenged the loss with an emphatic 4th round KO and concluded his career with an 8th round KO over Mike Tyson (2002) and a 6th round TKO over Vitali Klitschko (2003). His pro record reads 41-2-1 (32 KOs). Lewis now serves as expert commentator for HBO's Boxing After Dark telecasts.